This training is in a workshop and discussion format to share existing knowledge about the safe use of stilts with the other attendees. This course is prepared based on information from the following sources. Is the site ‘plaster ready’? Is the task stilt suitable? Other information; Electrical power, fuels, storage, PPE requirements & so on. A building company has been fined €250,000 for breaching construction regulations which resulted in the collapse of wall at a Longford DIY store three years ago, killing two men and injuring two others. Yesterday in a special sitting of Longford Circuit Criminal Court a construction company, ‘Vincent Ruane Construction Ltd’, was fined a total of €250,000 before Judge John Hannan. Previously, on the 5th July 2016, the company pleaded guilty to a breach of Regulation 44(d) of the Safety, Health and Welfare at Work (Construction) Regulations 2006. In a victim impact statement on behalf of her mother Patsy, Denise Nolan, a daughter of the late Mr Gaffney, told the court that her father had survived a back operation and a triple heart surgery and also beaten cancer before tragedy struck three years ago. On the day of the incident, Patsy Gaffney had been waiting in the car for her husband when she was alerted to an incident inside the store. She found her husband surrounded by debris, sitting upright with blood pouring from a head wound. “He was able to tell me that he ‘wasn’t going to make it this time’,” she said. On behalf of Mr Mulleady’s wife Teresa, her sister Eileen Sorohan said instead of receiving flowers from her husband on New Year’s’ Day, she now puts them on his grave. Judge Hannon said the maximum fine the court could hand down was €3m. Ammonia has been the refrigerant of choice for industrial refrigeration systems in Ireland and the UK for over 50 years. Ammonia (including Anhydrous Ammonia (R717) Refrigerant) is one of the very few natural refrigerants on the market and offers significant benefits, particularly in the face of the impending phase-down of HFC refrigerants. Many Ammonia refrigeration systems have been operating safely and efficiently in Ireland and the UK for thirty or even forty years. To ensure safe operation throughout their long life, ammonia refrigeration systems do need to be properly maintained and managed. Good practice in the design, installation and maintenance, along with compliance with applicable legislation and guides can ensure that ammonia systems continue to provide safe, reliable and efficient refrigeration service. At Ayrton Group, we can provide you with a range of services, with the intention of ensuring you have a preventative approach to your equipment for safeguarding your staff, neighbours & your plant. Whether you own or operate a refrigeration unit, a cold storage facility or use ammonia gas for any other purpose, we at Ayrton Group can help you. Risk assessments of current signage & advice of signage requirements. Ayrton Group provide an Ammonia Awareness Training course which we have designed for all personnel who may come into contact with Ammonia in their workplace (including Anhydrous Ammonia (R717) Refrigerant). The HSA recently issued an alert to highlight the importance of ensuring that any scaffolding component used is in safe working order and in an appropriate condition for the task being undertaken. Corroded and rusting scaffolding components can lead to serious issues with the scaffolding’s structural integrity and can lead to catastrophic failures and scaffolding collapses. Rusting is most prone on non-galvanised scaffolding systems and in particular on the wedge type painted steel scaffolding systems common in Ireland. A thorough inspection routine must be in place for inspection of scaffolding components to ensure that any components with corrosion or defects that would impact their safe use are removed and not used. This is particulary important if scaffold elements are coming out of storage having not been in use for some time. A thorough visual inspection will identify most corrosion, rust and pitting. Other signs of corrosion include loss of weight of the component, reduction in the tube wall thickness, corrosion around welds and on the inner tubes. Surface rust should be cleared in order to inspect a component correctly. If the component is damaged it needs to be put out of use or repaired by a competent person and repainted. Note: Sand blasting and painting only of scaffolding components, while reducing further deterioration, does not repair damaged components and may actually hide damage. 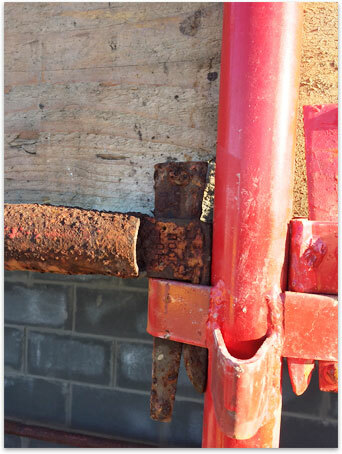 Rusted scaffolding components can also cause tetanus which is a serious disease caused by bacteria entering the body through open wounds or cuts. Inspection of scaffolding components must be carried out by a competent person and the condition of components should be continually inspected as part of the scaffolding inspection routine. Excessively rusted or corroded scaffold should never be used in a scaffold assembly. Any defective components should be put out of use or repaired by a competent person. The manufacturers manual for all system scaffolds must be available when erecting, modifying and dismantling scaffolds. This should also inform the user in relation to maintaing the scaffold in good order. The fourth annual Farm Safety Week starts today, with the IFA and its partners reminding people that farming kills and injures more people than any other industry in Ireland and the UK. While farm fatalities were down by 40% in 2015, with 18 deaths reported versus 30 in 2014, four of them child fatalities, the organisers insist that far greater awareness is needed to improve safety on the farm. The campaign will feature themed messages each day this week, covering subjects such as falls, machinery, livestock, transport and children on farms. This year’s Farm Safety Week is supported by more organisations than in prior campaigns, including the Farm Safety Foundation, Farm Safety Partnerships, Health & Safety Executive, Health & Safety Executive for Northern Ireland and the Health & Safety Authority, Ireland. It aims to educate and inspire to improve agriculture’s poor safety record. “These are not just statistics,” said Pat Griffin, senior inspector with the Health and Safety Authority and member of Farm Safety Partnership Ireland. “Behind each story is a grieving family, a community in shock, and a farm that needs to continue being farmed no matter what has happened. Monday focuses on the theme of falls, which caused one-fifth of Ireland’s fatal farm accidents in 2015. IFA President Joe Healy, “Farming remains a labour-intensive and sometimes dangerous occupation. “Each year farm fatalities in Ireland reach double figures and more than 1,000 injuries occur on farms. Minister for Agriculture, Michael Creed, added: “I’ve seen first-hand the devastation that follows farm accidents and fatalities. The impact on families and communities is unquantifiable. These Regulations amend the Safety, Health and Welfare at Work (General Application) Regulations 2007 (S.I. No. 299 of 2007) as previously amended by the Safety, Health and Welfare at Work (General Application) (Amendment) Regulations 2007 (S.I. No. 732 of 2007), the Safety, Health and Welfare at Work (General Application)(Amendment) Regulations 2010 (S.I. No. 176 of 2010) and the Safety, Health and Welfare at Work (General Application)(Amendment) Regulations 2012 (S.I. No. 445 of 2012) by inserting Part 11 (Woodworking Machines), Part 12 (Abrasive Wheels) and Part 13 (Abrasive Blasting of Surfaces) as well as adding Schedule 13 (Woodworking Machines) and Schedule 14 (Training and Instruction) to the Regulations. The collective Regulations shall be cited together as the Safety, Health and Welfare at Work (General Application) Regulations 2007 to 2016. The purpose of the Regulations is to bring specific workplace safety matters relating to Woodworking Machines, Abrasive Wheels and Abrasive Blasting of Surfaces within the scope of the Safety, Health and Welfare at Work Act 2005 following the repeal of corresponding Regulations made under the Factories Act 1955, as amended by the Safety in Industry Act 1980. The Regulations are designed to retain, by means of amendments to the Safety, Health and Welfare at Work (General Application) Regulations 2007, the aspects of the provisions of Regulations under the Factories Act that remain relevant and are therefore reproduced in line with the new legislative format. (c) Safety in Industry (Abrasive Wheels) Regulations, 1982. (S.I. No. 30 of 1982).